Eight generations of Guillemots have worked the land in the Savigny-lès-Beaune appellation. Their wines are known for their classic Burgundian finesse, elegance and balance combined with a certain rusticity that is typical of Savigny. Domaine Pierre Guillemot makes traditional style Burgundies that appeal to old school Burgundy lovers. 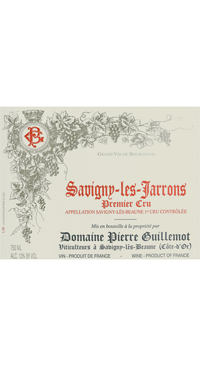 Savigny Les Jarrons is a premier cru vineyard in the Savigny-les-Beaune appellation in Burgundy’s Cote de Beaune subregion. These Pinot Noir grapes grow in soil composed of clay, sand and limestone. Guillemot ferments his reds for about 15 days in wooden cuves with regular multiple daily punchdowns. The wine is aged in barrel, 10% new, for 18 months and 6 months in bottle before release.